Previously I have shared many useful gadgets like popular post gadget, related posts gadgets, content slider, random post widget etc as it helps in increasing page views and every blogger need these gadgets. Today I am sharing a similar gadget which is also helpful in increasing pageviews, its a recent posts gadget. This is not an ordinary recent posts gadget, its special because it slides posts automatically. This gadget is widely used in blogs and is very popular. 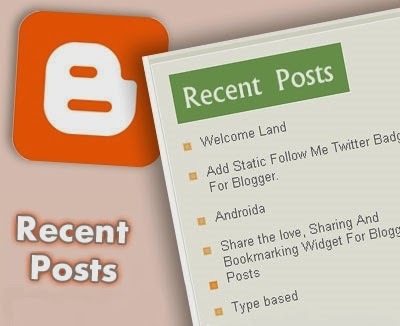 Related posts widget for blogger with different styles. Simple related post widget with thumbnails and links for blogger. Tips to increase blog traffic and generate more than 600 page-views/day. Stylish Featured Posts Widget For Blogger. 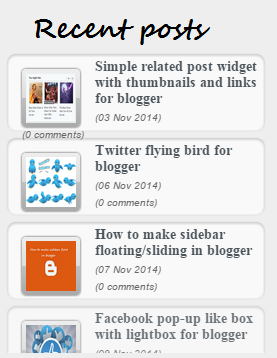 Cool Popular Posts Widget For Blogger. Step 2: Select layout and click on add a gadget. Step 5: Replace https://101helperblogspot.com with your blog's link and also change https://yourblog.blogspot.com with your blog link in the end of the code similar to below shown code. Step 6: Click on Save and you are done. This gadget has cool effects also like when a thumbnail is hovered by mouse it becomes round and fades out. This gadget slides your content automatically and when a post is hovered its background color is also changed. You can customize it if you have a little knowledge about Css. Some easy things that you can customize in this gadget without having knowledge about Css are discussed below. If you want to customize this gadget as you like then learn it by reading below. Make changes in borderColor = "#232c35"; // Get Code Of A Color! Make changes in intervalspy=4000; // 4000 means 4 seconds! I hope you like this gadget. If you have any problem regarding this post ask me in comments or contact me. Share this post with others if you like it. Follow and subscribe to get latest news about blogger gadgets. Search Tags: Recent posts gadget for blogger, how to add recent posts gadget in blogger, Display recent posts in blog, add recent posts gadget in blogger, free blogger gadgets, related posts gadget with thumbnails for blogger, 101Helper gadgets for blogger, how to increase blog traffic.